The Incal is one of those comic stories that have taken on a legendary status, especially among comic creators. 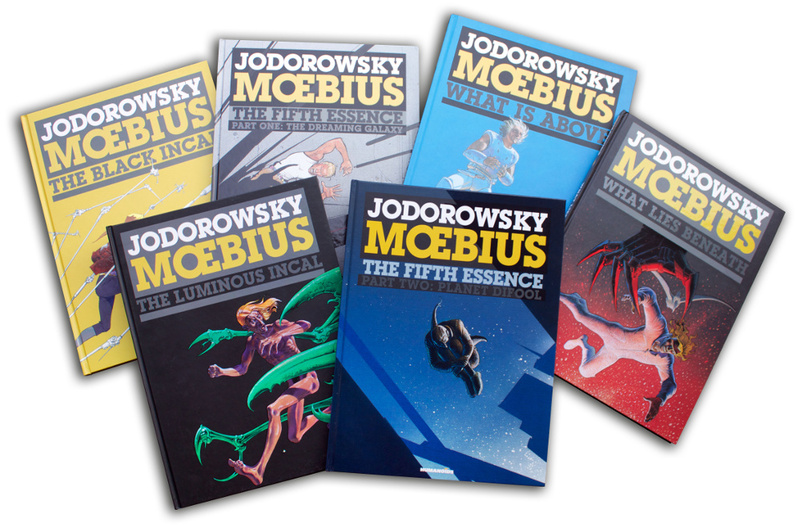 First released as six volumes in French, it’s considered the highlight of Moebius’ career. Printed in English several times, notably by Epic and Graphitti Designs in the 1980s and most recently Humanoids. In fact a deluxe oversized slipcased edition was the relaunch book for Humanoids U.S. and quickly sold out, prompting a hardcover in their standard size. It took me until a con perusing in May that I flipped through one and bit the bullet, once I had negotiated a sweet deal from the seller. I quickly put my order in for the rest at my local comic shop, since they’re not readily available online and I have a great discount there, and patiently waited for each volume until the final release last week. These are stunning books with exceptionally high production values, including sewn binding, very heavy paper stock and a silk book mark. Size is the first thing that strikes you: these are very large books; see the image above for a comparison to the collected hardcover. Sine they’re only 48 pages these volumes are light enough to read on your lap. The sewn binding allows every page to open and lay flat: overall an extremely high production value. One interesting and enjoyable choice was matte paper stock. It looks right and I didn’t notice the change until I was comparing pages; see below and please excuse the shadows. Humanoids posted about these volumes and the fact they were available for sale from that site or through a local comic shop. I was surprised to see that all volumes were still around, even though they were limited to 999 copies. I checked Diamond and volumes 3-6 are in stock but that’s it. If you want the set go to Amazon (links below) or the Humanoids store. That led me to sales for the six volumes; these are pulled from Diamond’s sales numbers and filtered by ICv2. The Black Incal, January 2013, sold 366. The Luminous Incal, March 2013, sold 439. What Lies Beneath, May 2013, sold 452. What Is Above, August 2013, sold 358. The Fifth Essence Part One: The Dreaming Galaxy, November 2013, sold less than 386 (chart cut-off point). The Fifth Essence Part Two: Planet DiFool, January 2014, won’t have data until February. 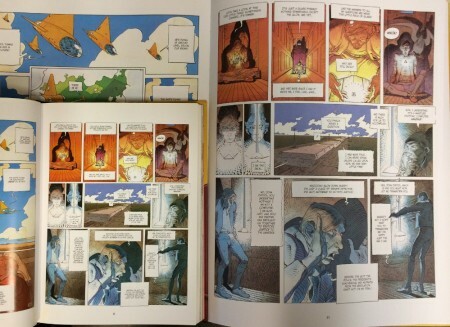 Owning the complete Incal in these oversized coffee table editions will set you back $480 and is a large commitment for the most diehard of fans: yes, $1.67 a page. I can sing the praises of these books all day long but that’s a lot of money, although the price point pain wasn’t too bad over the last year as I picked up one every other month. 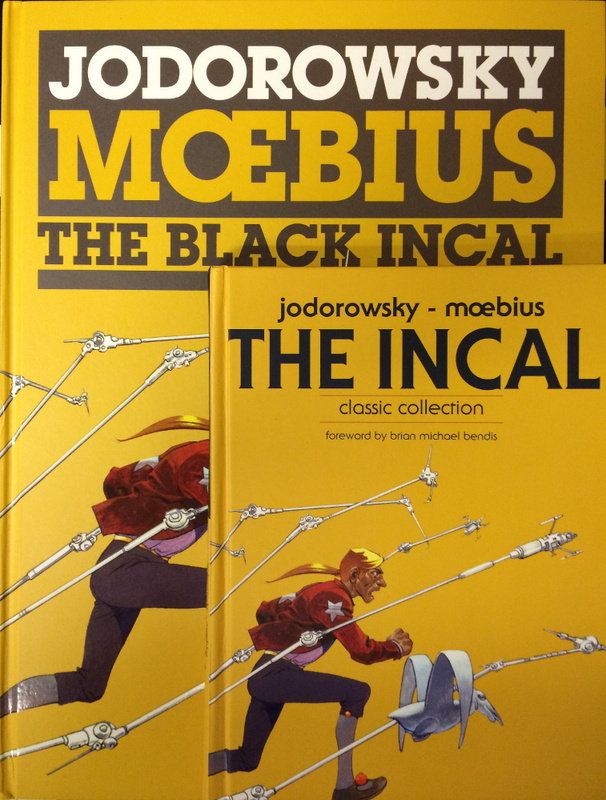 Thanks to Humanoids there are editions of The Incal available to all readers and all budgets.